While the bureaucratic lizardling empire sends its well-trained units onto the battlefield in regimented rows and columns, the only wild cards on the field are the knights. 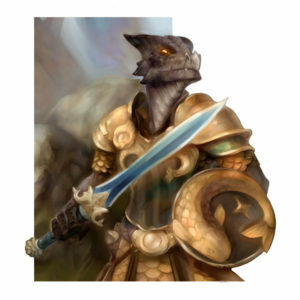 Knights are the smartest, most careful combatants in a lizardling army, carefully surveying their enemy for weak points and exploiting them. 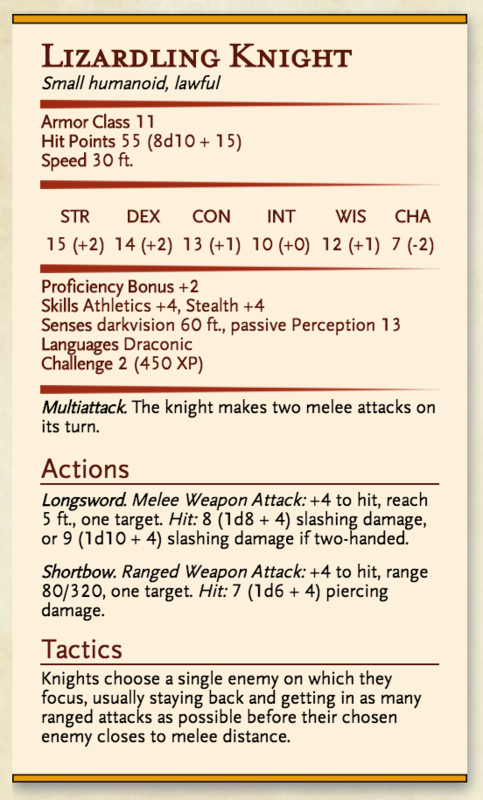 A knight will identify a dangerous enemy—particularly ranged spellcasters—and fire at it from range while closing, then switch to its sword and make two-handed attacks until its enemy drops to the ground. Multiattack. The knight makes two melee attacks on its turn. Longsword. Melee Weapon Attack: +4 to hit, reach 5 ft., one target. Hit: 8 (1d8 + 4) slashing damage, or 9 (1d10 + 4) slashing damage if two-handed. Shortbow. Ranged Weapon Attack: +4 to hit, range 80/320, one target. Hit: 7 (1d6 + 4) piercing damage. Knights choose a single enemy on which they focus, usually staying back and getting in as many ranged attacks as possible before their chosen enemy closes to melee distance.